Katie Mullen from Changing Faces was the guest speaker at a recent meeting of the Rotary Club of Ayr where she most eloquently delivered a very interesting talk. Changing Faces supports people who have scars, marks or conditions which affect the appearance of their face or body. The charity’s goal is to create an enlightened society that fully values and accepts people who have a disfigurement. Katie’s own role in the organisation is Public Fundraiser in Scotland; a role that she clearly relishes. She explained that disfigurement can be a whole range of things: for example effects on someone injured or burned in an accident; a skin condition such as psoriasis or eczema; a birth condition such as Treacher Collins Syndrome; an acquired facial paralysis; or perhaps hair loss due to alopecia. Changing Faces supports its beneficiaries through its services and advocacy for fair and equal treatment by society. The organisation was founded in 1992 by Dr James Partridge OBE and has just celebrated its 25th anniversary. When James was 18 years old he was badly burned in a car accident. His road to recovery was very difficult, emotionally and physically, but James was determined that the unique insights gained during his prolonged recovery should be put to positive use and he began writing in his spare time. This was the beginning of the birth of the charity. The work of Changing faces is divided into two areas: The first is Changing Lives, whereby the aim is to help individuals lead full, confident and satisfying lives. The second, Changing Minds, is the campaigning aspect of the charity’s work. The aim here is to transform public attitudes towards people with an unusual appearance and the charity’s campaign for Face Equality is all about being treated fairly and equally irrespective of disfigurement. Friday 26 May was the charity’s 25th anniversary and was marked by the first every “Face Equality Day”, to raise awareness of its work across the UK. 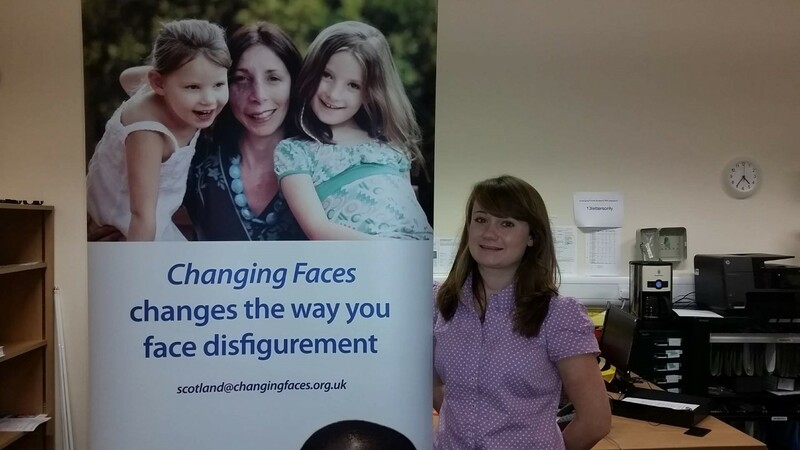 In 2014 Changing Faces opened its Scotland centre in Edinburgh with the aim of promoting public knowledge of its campaigns and services across Scotland including its “Face Equality in Schools” project, whereby a Schools Liaison worker provides workshops for teachers and pupils to promote inclusion and to tackle appearance-related bullying. There are Skin Camouflage clinics in ten locations across Scotland (including Crosshouse Hospital) where trained volunteers show clients how to use specialised creams and powders to cover marks or scars. Emotional support services are also available whereby Changing Faces Practitioners can help children and young people to build their confidence and to cope with unwanted remarks and staring. Academically Katie has a science-based background and was attracted to her current role by the can-do attitude of the charity. Geoff Barbour gave a well-deserved vote of thanks to Katie and congratulated her on her confident and highly listenable delivery.